BEAM Plus Interiors has been introduced in response to strong demand from the marketplace for a localised benchmark for interiors fit-out, renovation and refurbishment works. The assessment tool continues the evolution of BEAM Plus through more comprehensive coverage and higher performance expectations. 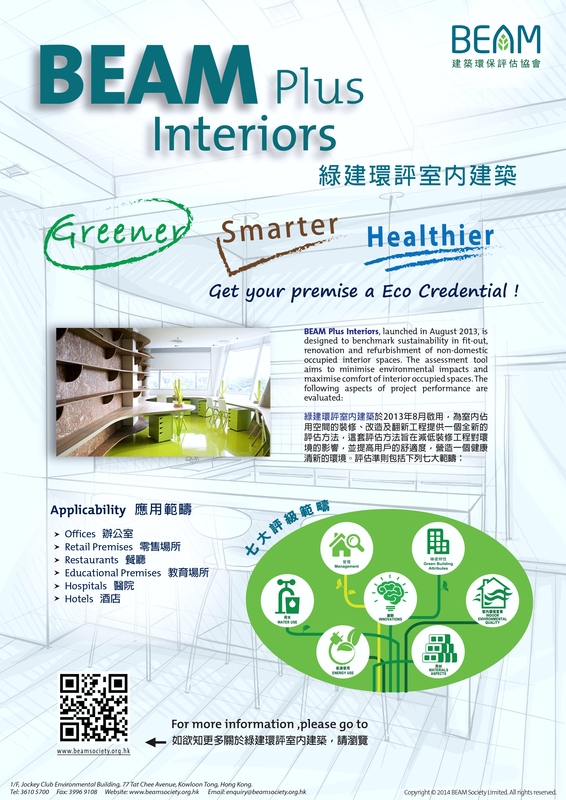 It provides owners, tenants and interior designers with an independent third-party certification for non-domestic, normally occupied spaces within buildings. Requiring only a one-stage assessment process at the end of the fit-out, renovation or refurbishment and associated testing and commissioning, BEAM Plus Interiors offers four certification levels, namely, Platinum, Gold, Silver and Bronze. 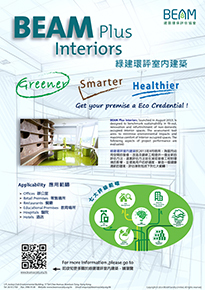 The new assessment tool is applicable to office and retail premises, hotel rooms and function rooms, restaurants, educational facilities and institutional facilities such as hospitals. *Submission for BEAM Plus Assessment received after 12:00noon will be recorded and processed on the following working day.